The Islamic State's West Africa Province (ISWAP) claimed multiple mortar strikes on Nigerian soldiers in Borno and Yobe states, all of which took place during the country's elections. 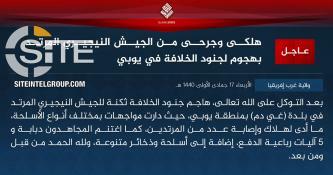 The Islamic State's West Africa Province (ISWAP) issued a formal communique for the attack in Dikwa in which it claimed killing 15 Nigerian soldiers. 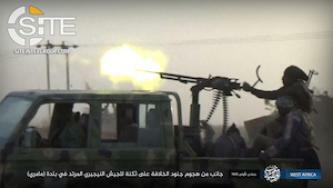 The Islamic State's West Africa Province (ISWAP) claimed killing seven Nigerian soldiers in Ajiri, a town in Borno State. The Islamic State's West Africa Province (ISWAP) claimed killing and wounding multiple Nigerian soldiers in an attack in Geidam, a town in Nigeria's Yobe State. The Islamic State's West Africa Province (SWAP) claied two separate attacks in the same day on Nigerian military positions in Borno State, one in Kareto, and the other in Baga. Two days after its attack on a Nigerian military position in the town of Mamuri in Borno State, the Islamic State's West Africa Province (ISWAP) published photos of the operation and the war spoils it captured.